Silicon Valley was born in an era of applied experimentation driven by scientists and engineers. It wasn’t pure research, but rather a culture of taking sufficient risks to get products to market through learning, discovery, iteration and execution. This approach would shape Silicon Valley’s entrepreneurial ethos: In startups, failure was treated as experience (until you ran out of money). The combination of Venture Capital and technology entrepreneurship is one of the great business inventions of the last 50 years. It provides private funds for untested and unproven technology and entrepreneurs. While most of these investments fail, the returns for the ones that win are so great they make up for the failures. The cultural tolerance for failure and experimentation, and a financial structure which balanced risk, return and obscene returns, allowed this system flourish in technology clusters in United States, particularly in Silicon Valley. Yet this system isn’t perfect. From the point of view of scientists and engineers in a university lab, too often entrepreneurship in all its VC-driven glory – income statements, balance sheets, business plans, revenue models, 5-year forecasts, etc. – seems like another planet. There didn’t seem to be much in common between the Scientific Method and starting a company. And this has been a barrier to commercializing the best of our science research. Today [July 28], the National Science Foundation (NSF) – the $6.8-billion U.S. government agency that supports research in all the non-medical fields of science and engineering – is changing the startup landscape for scientists and engineers. The NSF has announced the Innovation Corps – a program to take the most promising research projects in American university laboratories and turn them into startups. It will train them with a process that embraces experimentation, learning, and discovery. The NSF will fund 100 science and engineering research projects every year. Each team accepted into the program will receive $50,000. To commercialize these university innovations NSF will be putting the Innovation Corps (I-Corps) teams through a class that teaches scientists and engineers to treat starting a company as another research project that can be solved by an iterative process of hypotheses testing and experimentation. The class will be a version of the Lean LaunchPad class we developed in the Stanford Technology Ventures Program, (the entrepreneurship center at Stanford’s School of Engineering). This is a big deal. Not just for scientists and engineers, not just for every science university in the U.S., but in the way we think about bringing discoveries ripe for innovation out of the university lab. If this program works it will change how we connect basic research to the business world. And it will lead to more startups and job creation. 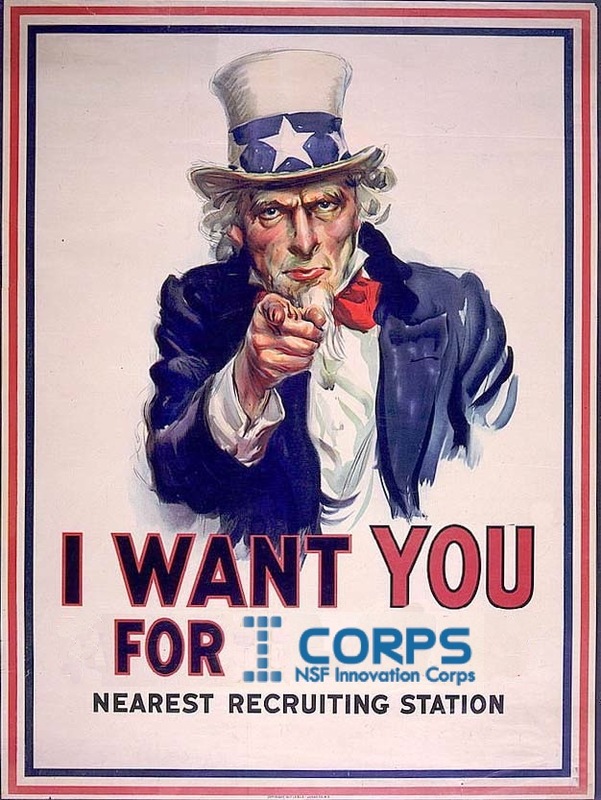 The NSF Innovation-Corps program (I-Corps) is designed to help bridge the gap between the many scientists and engineers with innovative research and technologies, but little knowledge of the first steps to take in starting a company. I-Corps will help scientists take the first steps from the research lab to commercialization. Over a period of six months, each I-Corps team, guided by experienced mentors (entrepreneurs and VC’s) will build their product and get out of their labs (and comfort zone) to discover who are their potential customers, and how those customers might best use the new technology/invention. They’ll explore the best way to deliver the product to customers, the resources required, as well as competing technologies. They will answer the question, “What value will this innovation add to the marketplace? And they’ll do this using the business model / customer development / agile development solution stack. At the end of the program each team will understand what it will takes to turn their research into a commercial success. They may decide to license their intellectual property based on their research. Or they may decide to cross the Rubicon and try to get funded as a startup (with strategic partners, investors, or NSF programs for small businesses). At the end of the class there will be a Demo Day when investors get to see the best this country’s researchers have to offer. A first reaction to the NSF I-Corps program might be, “You mean we haven’t already been doing this?” But on reflection it’s clear why. The common wisdom was that for scientists and engineers to succeed in the entrepreneurial world you’d have to teach them all about business. But it’s only now that we realize that’s wrong. The insight the NSF had is that we just need to teach scientists and engineers to treat business models as another research project that can be solved with learning, discovery and experimentation. And Stanford’s Lean LaunchPad class could do just that. The National Science Foundation is publishing the application for admission (what they call the “solicitation for proposals”) to the program. See the NSF web page here. The syllabus for NSF I-Corps version of the Lean LaunchPad class can be seen here. Along with a great teaching team at Stanford, world-class VC’s who get it, and foundation partners, I’m proud to be a part of it. This is a potential game changer for science and innovation in the United States. Join us. Apply now. So what does this class have to do with Berkeley?? The Lean LaunchPad will be taught this fall as part of the Berkeley/Columbia Executive MBA program. And starting next spring it will become part of the offerings in the Haas Business School’s Lester Center for Entrepreneurship. Cross-posted from Steve Blank’s blog. This is good news Steve, but my fear is that politics is always in the wings waiting to turn all good work into arms, or some hegemonic device. It’s been years since I left Cal, but has something changed, especially in today’s climate, to insure the fickle hands of Washington stay out of the good work of science?